There is a common misconception that jaundice isn’t a severe condition and that eventually, it will clear up on its own. While that may be true in some instances, in other cases a severe case of jaundice can lead to brain damage, which can cause cerebral palsy. Learn about the causes, different types, symptoms, and treatments of jaundice, as well as what to watch out for at home and when to call your baby’s doctor. According to the Centers for Disease Control and Prevention (CDC), jaundice is a medical condition marked by a yellowish tint to a newborn’s skin. Jaundice occurs when bilirubin breaks down in a baby’s body and i. Bilirubin is a yellowish-brown substance found in bile, created after the body’s older red blood cells break down. Newborns produce more red blood cells when compared to adults, which results in a higher turnover of the blood cells, leading to jaundice. Normally, the red blood cells eliminate via bowel movements, but if the infant’s intestines absorb the red blood cells, jaundice occurs. A newborn baby’s liver (especially those born prematurely) is still developing and may not be able to remove bilirubin yet. Around 60% of all infants born in the United States have jaundice. While some infants have mild cases, the babies with high levels of bilirubin must be monitored closely as untreated jaundice can lead to severe medical problems, and in some cases, death. “Normal” Jaundice: Many newborns will have at least some jaundice while their liver continues to develop. Mild jaundice usually disappears within a few weeks after birth, but it’s always important to have your baby’s pediatrician rule out any medical concerns. Breastfeeding Jaundice: A number of breastfed babies may develop jaundice. This generally occurs when infant’s don’t get enough breast milk, as the mother’s breast milk isn’t fully in yet. This isn’t the same as breast milk jaundice since the jaundice isn’t a result of breast milk. Premature Infant Jaundice: Jaundice is more common in premature babies since their bodies aren’t fully developed yet. Breast Milk Jaundice: This type of jaundice occurs when breast milk substances make bilirubin levels rise. This form of jaundice is rare, only accounting in around 1% to 2% of newborns. It generally occurs within a week after birth, and subsides within a few weeks. The exact cause of breast milk jaundice isn’t known, but scientists suspect it has something to do with a substance in the mother’s milk that stops the baby’s liver from breaking the bilirubin down properly. Blood Incompatibility: Blood incompatibility between mother and baby can also cause the infant to develop jaundice. The mother’s blood may produce antibodies that eliminate the baby’s red blood cells, which causes bilirubin to build up. Jaundice usually appears shortly after birth, and the yellowish tint is more easily detectable on infants with light skin shades. It can appear all over the face, as well as the arms, legs, stomach, neck, head, and toes. If jaundice is severe and left untreated, babies are in danger of developing kernicterus, a rare form of brain damage that occurs when bilirubin builds up to extremely high levels and enters the brain. According to the U.S. Library of Medicine, kernicterus is a life-threatening neurological condition that typically developed within the first week of life. If an infant develops kernicterus, a host of other associated disorders may follow, including cerebral palsy, seizures, hearing loss, and vision problems. In severe cases, especially if treatment isn’t started as soon as possible, kernicterus can lead to death. 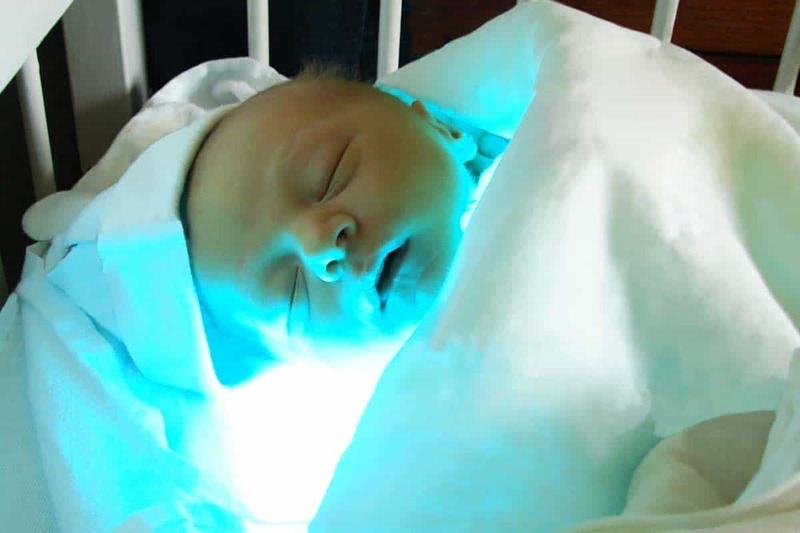 If an infant has high bilirubin levels, physicians will generally put the baby under specialized lighting (known as light therapy or phototherapy) in order to bring the levels down. If the bilirubin levels are significantly high, a blood exchange procedure may be performed. Babies born prematurely have the highest rates of developing jaundice and kernicterus. Other risk factors include blood incompatibilities, maternal infections, and macrosomia. Medical neglect caused by physicians and other professionals can also lead to kernicterus. The following instance are examples in which healthcare professionals act negligently, which can cause brain damage and other medical issues. Unfortunately, numerous babies have developed kernicterus and cerebral palsy at the hands of negligent physicians and medical staff. If your baby was injured due to medical negligence, keep in mind that you have the legal right to file for damages against the responsible party. Even if your baby’s jaundice seems mild, never assume that it will go away on its own. It’s always a good a idea to check with your baby’s doctor. Keep in mind that it’s hard to determine if the jaundice is severe by just looking at your baby. Additionally, it’s more difficult to see jaundice on infants with darker skin, but if you press your hand on your baby’s skin and the area turns yellowish, this may indicative that your infant has jaundice.